In past years I have attempted to ride at least a mile in every month of the year. I'm not sure I ever did it, generally missing a month along the way somewhere. In 2004, the month I missed was September, the month we painted the house, but usually I'd omit January or February or November. Even in years when I did get my mile in it would often mean teetering up and down the street until the odometer clicked over 1.0 and then back into the warmth of the house. This year I decided to try riding more in the winter. 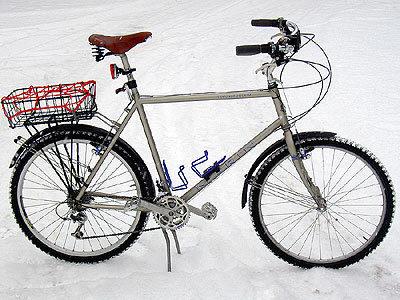 Being a guy who likes gear, I decided the thing to do was to equip my Marin with studded snow tires. I was down at Freewheel during the week and stopped in to buy tires. I think I meant to buy the 106-stud Nokian Hakkapeliittas but either they didn't have them or I didn't pay enough attention and instead bought a pair of 26 inch Nokian Mount and Ground 160s, with 160 studs each. At least they have an easier name to pronounce. All done, I took the Marin out and rode it around in the driveway and yard. 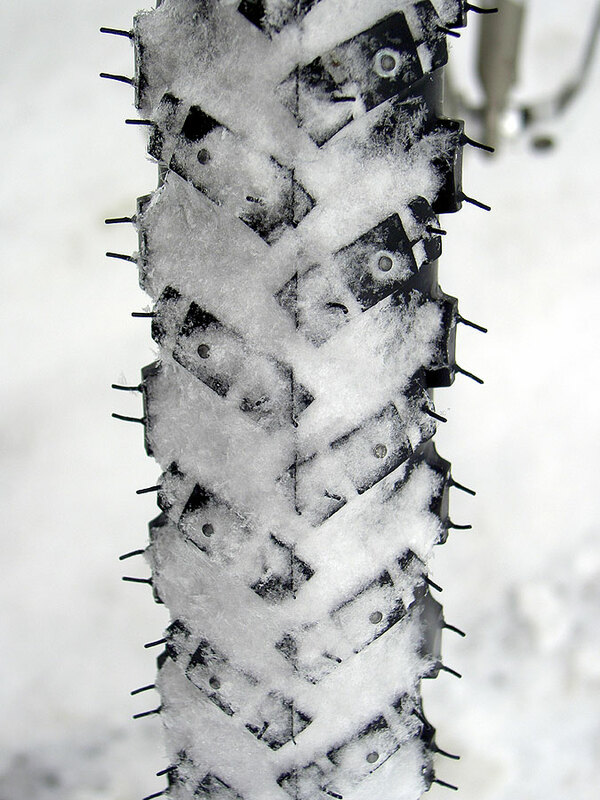 I don't know if the Nokians grip that much better or if they just give you unwarranted confidence but I rode without difficulty on our snowy driveway. This is the tire after a bit of riding. You can tell it's brand new from all the little rubber things sticking up off the tire. You can see the studs in the tire either side of the centerline. Here's the Marin. 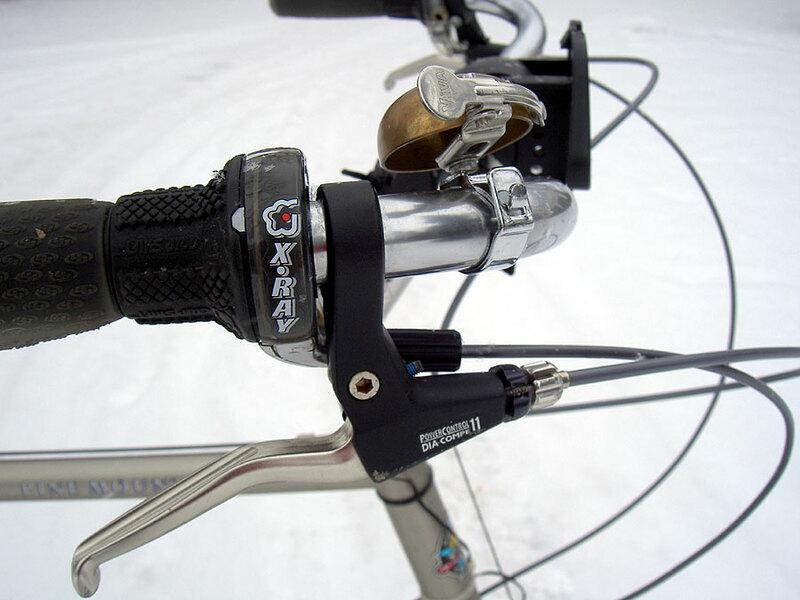 One reason I hadn't done more than teeter up and down a mile during the cold months has been a reluctance to expose my main bike to the winter salt on our streets. This is still true; I don't expect to ride the Atlantis, acquired last spring and now my main bike, this winter, but the Marin I am now willing to try. It's a beefy mountain frame, is well-suited to plowing into surprise potholes and whatnot and, while hardly a junker, is my secondary bike, relegated to pumpkin duty and local runs to the grocery store. I'm not as worried about operating this bike in the harsh conditions of a Minnesota winter. There was other work to do, too. 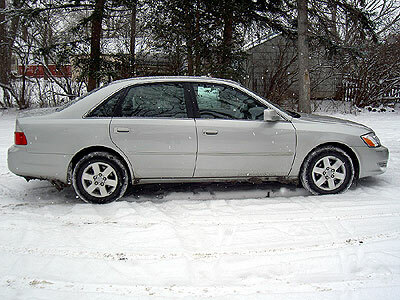 Our main car is a Toyota Avalon, two years old now. We don't buy new cars very often and thought a long time before getting this. There were those who suggested we get an SUV for the safety of four-wheel drive. We wanted lots of leg room, particularly in the back seat, and fell for the Avalon the first time we test-drove a used one. I thought about the 4WD thing; we don't do off-roading, and the times we need extra traction the issue is typically one of tire grip rather than road clearance or needing all-wheel drive. Also, you look at the death rates for occupants of large sedans versus sports utility vehicles and the sedans come out much better. While it is true that in a crash between a Suburban and our Avalon, the Avalon is likely to come out worse, overall, the death rates in Suburbans (to pick one vehicle) are much higher. A lot of this has to do with large SUVs rolling over, an uncommon crash in a low-slung sedan, much more frequent and disproportionately deadly in higher and heavier SUVs. The sedans stop shorter, turn and accelerate more quickly, have better visibility, sit lower and, in a car the Avalon's size (3,400 lbs), still offer a lot of structural protection. In thinking about our snowy and icy roads, I decided that a good compromise would be to get the Avalon, roomy, powerful and comfortable, and get a set of snow tires. I ordered up a set of Bridgestone Blizzaks from The Tire Rack and, being a cheapskate, got them on the painted black steel rims rather than the expensive alloy ones. These look pretty hideous. Here's the Avalon, freshly returned from Schoonover Body Works after its third visit in two years. This car has proved irresistable to others, who keep running into us. At the same time I bought the Blizzaks, I went to Sears and got a hydraulic jack so I could do a NASCAR-like tire changes rather than use the car's own jack. So, having re-shod the Marin, I went out and got out the hydraulic jack to hoist the Avalon. I pumped and pumped and pumped and it would raise about three inches and stop. I retreated to the garage, rummaged around to find the instructions for it and sat out in 15 degree comfort reading about my jack. It sounded like I was going to need more hydraulic jack oil, though where the old stuff was I have no idea. There was no puddle on the shelf where I store it. On the other hand, I could ride the Marin! 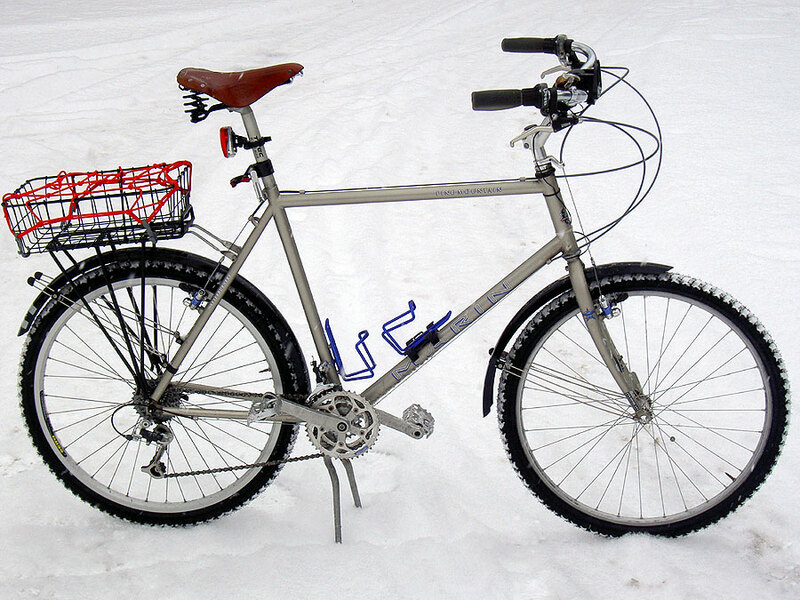 I got the bike out, suited up, and rode out through the snow of the backyard and off down the snow-covered streets. The Nokians seemed to grip well. I wasn't exactly leaning through the curves threatening to drag my pedals, but neither was I teetering along perfectly vertical, afraid to lean at all. I plowed through the light snow, through heavier bits where it had been plowed, and on clear pavement. I haven't ridden knobby tires in years. They look enormous even though they're much smaller than the original knobbies that came on the bike. I rode down to the local Checker Automotive store and bought myself a bottle of hydraulic oil. Then I saddled up and rode back, partly on a busy road cleared to the pavement, partly on the snowy side streets. The snow tires worked great. I filled the jack and sure enough, it jacked fine, then spent a busy and un-NASCAR-like 40 minutes putting on the snow tires. 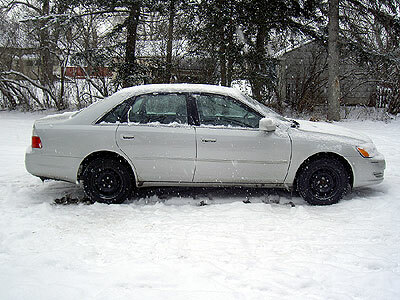 Here's the Avalon with the snows on it. It looks like a law-enforcement model. There, now the fleet is ready. We'll drive around in the Avalon with our superior grip and anti-lock brakes waiting to get clobbered from behind by out-of-control drivers. I can do the same on my bike! This should be a fun winter! Good luck with the Nokians. You will find them a lot of fun. My dad works for a tire wholesaler, I run the Blizzaks on our minivan and our Outback because we can get them at cost.